Flown in prototype form early in 1966, the Agusta A.106 is a small lightweight armed helicopter designed initially to fulfil an antisubmarine role. 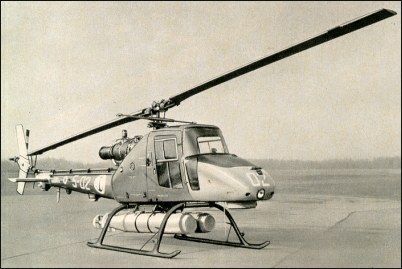 Its predecessors were the experimental piston-engined A.103 and A.104, and the A.105 which was flown in April 1964 with an Agusta-built Astazou shaft turbine. The A.106, a single-seater, went into production in 1968 for the Italian Navy, with whom it will serve aboard small naval vessels as an anti-submarine helicopter operable in poor weather conditions and carrying target identification equipment and a pair of underslung Mk.44 homing torpedoes. Provision exists for substituting flotation bags for the standard skid landing gear, and an auxiliary fuel tank may be carried externally. The 2-blade main rotor, and the tail section including the 2-blade tail rotor, can be folded for stowage on board ship. Alternative applications of the A.106 are Army support; light crane duties with loads suspended from an under-fuselage hook; or casualty evacuation vehicle with 2 externally-mounted stretcher cases. The A.106 made its first flight in November 1965. It was developed to meet a somewhat ambitious Italian naval specification for a single-seat helicopter which could fit into the hangars of smaller vessels such as frigates. In designing it, Agusta drew upon the experience acquired with the A.103, A.104 and A.105 light helicopters. The little single-seater had a Turbomeca-Agusta TAA-230 turbine behind the very compact cockpit, and landing skids with auxiliary flotation gear (but provision for two inflated pontoons). The two-blade light alloy rotor could be folded back. Systems included an autostabilizing device, an acoustic submarine detector and armament of two Mk.44 torpedoes. The Italian Navy ordered two prototypes and five production aircraft, but construction of the latter was suspended in 1973. One of Italy's oldest aviation companies, Agusta, was established in 1907, but entered the helicopter field in 1952 when a licence to build the Bell 47 was acquired. This was followed by a series of other licence agreements with both Bell and Sikorsky, but in more recent years Agusta has developed several of its own designs. The smallest to come to fruition, even though only in a very modest way, the Agusta A 106 was flown in prototype form in November 1965. A small production batch followed in the early 1970s and about five of these were operated by the air arm of the Italian navy (Marinavia) from 'Impavido' class ships in the antisubmarine warfare role, supplementing larger naval ASW helicopters such as the SH-3D, AB 204AS and AB 212ASW. The A 106 had a two-blade main rotor and conventional tail rotor, and auxiliary flotation gear could be fitted to the skid framework, which had removable wheels for ground manoeuvring. Operations in poor visibility were assisted by comprehensive instrumentation and electronics, and the Ferranti company developed an electronic three-axis stability augmentation system for the A 106, providing a stable firing platform and damping out external disturbances. and auxiliary flotation gear could be fitted to the skid framework, which had removable wheels for ground manoeuvring.